You can also check out other Carly Rae Jepsen or Owl City tracks. And my boyish crush on Ms. Jepsen continues, for those of you who were wondering. …it’s pretty funny. Also pretty silly. I guess there are worse things you could do on a long road trip though. That’s the Harvard baseball team. Currently Harvard is ranked #233 (out of 297) in the NCAA Division I baseball standings. So at least they’re having fun. #3) I have seriously considered purchasing some. But I wonder if it would work….Ladies? If a guy handed you this, would you think it’s creepy (because he got these printed – presumably he gives them out a lot) or would it go into the ‘awh, you’re so cute’ category? 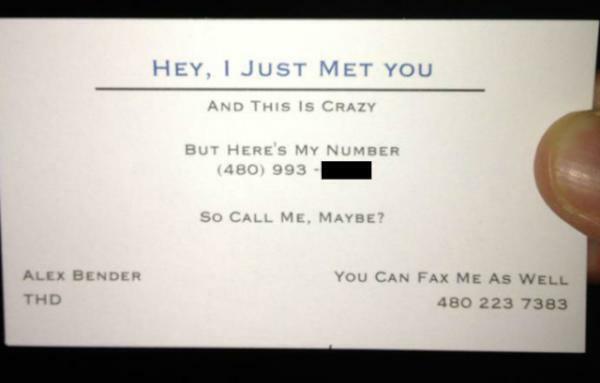 Would you call me, maybe?